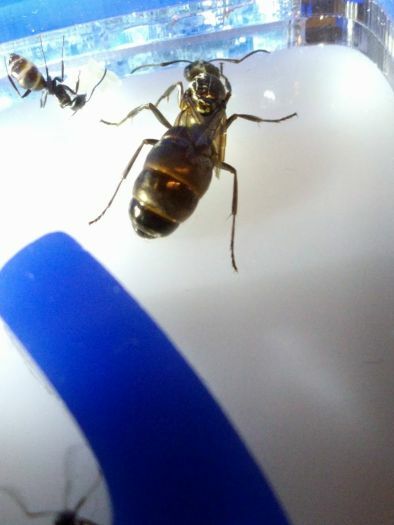 I caught this queen at a summer camp I go to each year. 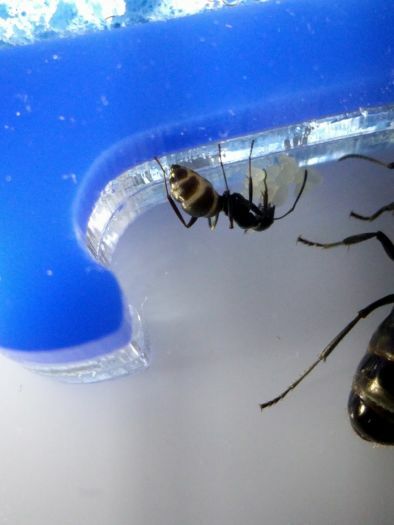 There happened to be a massive flight on Beach Day (the mother colony for this queen was at the beach) which was where I caught her. 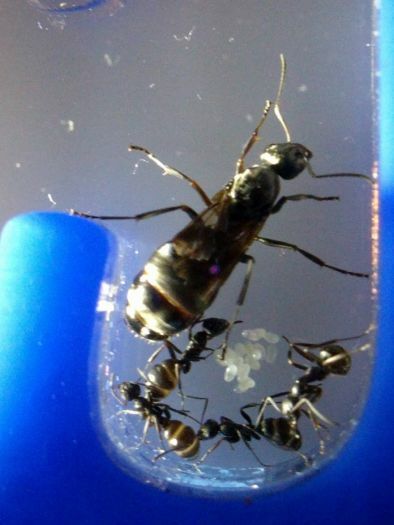 This is also what makes IDing this colony difficult. I'm 70% sure this is F. subsericea, but there's also a good chance that they could be F. argentea. The only visual difference between the two is that F. argentea is shinier than F. subsericea. The habitat doesn't help, either. Formica argentea's habitat is described as nesting in sandy soils to sand, while Formica subsericea is described as often nesting in "Open deciduous forests [...] and pine barrens". This queen's mother colony was living in the sand, but it was a VERY small beach ( about 10 meters long and 3 meters wide) and was surrounded by an oak/pine forest. 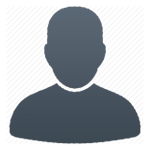 So if anyone could help me with a 100% ID, that would be great. 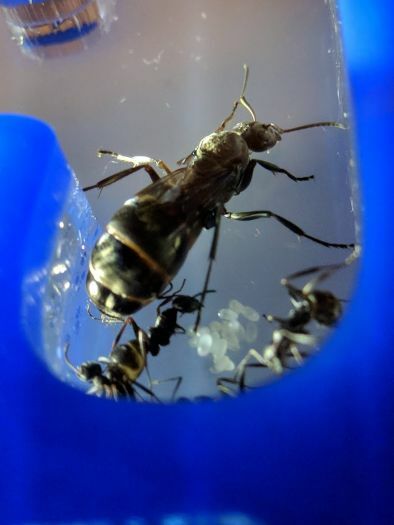 Anyways, I got the queen into a test tube setup with a small bit of sand. 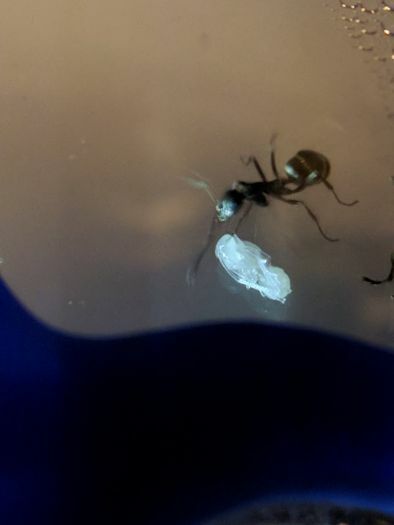 She laid eggs within a few days. The egg and larval stages went by fast, together lasting maybe one and a half weeks. However, when the larvae pupated, the pupal stage lasted about 2 months. The queen only laid one batch of eggs. As these grew, she didn't lay any more eggs. I assumed she was waiting until workers eclosed to take care of the next batch. After the workers eclosed, I counted, and there were five. But the queen didn't lay new eggs. Several months passed, and no new eggs. Then a couple weeks ago, I got a heating cable. Just a couple days ago, I looked into the test tube and noticed a large pile of 15-20 eggs. 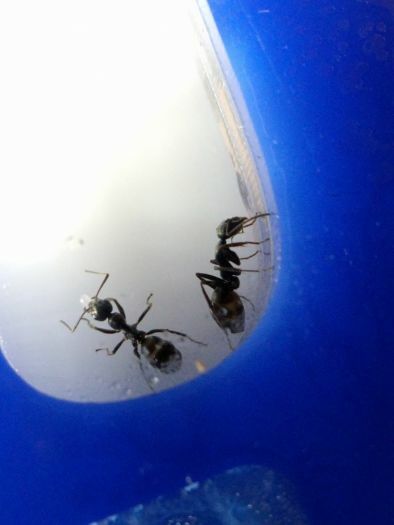 Yesterday, I moved them into a small AntsAustralia Acrylic Nest with an AntsRussia outworld. The visibility is MUCH better, and they seem to love it. They REALLY love the heat, too. Here are some photos of them in the new setup from yesterday. Edited by Mettcollsuss, May 17 2018 - 10:17 AM. Nice colony, I caught a few of this species and all failed to lay. Thank you for starting this journal. I love this species and will enjoy keeping up with your colony. It's interesting that your queen still has her wings. I've noticed that the queens of this species tend to keep their wings. I caught four of these on the flight, two of which were infertile. They are in hibernation now, but still have wings. The two that reared successful colonies still kept their wings. After about a month, the workers got tired of it and decided to take them off themselves. They were able to trim them (as seen in the photos), but couldn't get them off all the way. 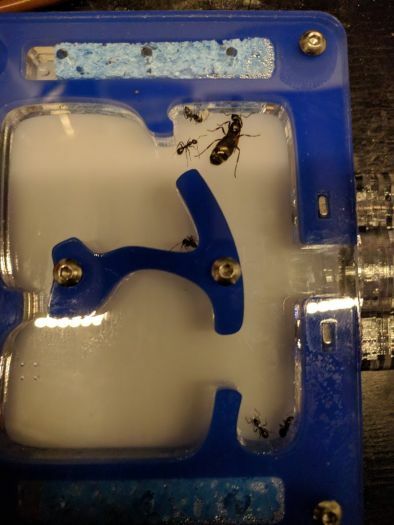 It's been another few months and the workers have given up trying to get them off, and the queen doesn't seem to be planning to drop them anytime soon. Edited by Mettcollsuss, December 19 2018 - 6:22 AM. Now that they've settled in, I decided to feed them. In the outworld, I placed a Galileo Liquid Feeder with honey water and a cut-up mealworm pupae. They haven't discovered it yet. 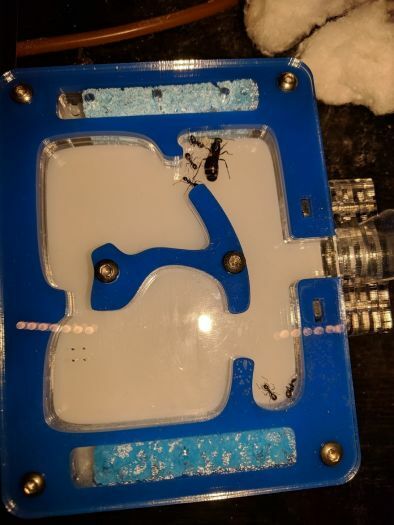 Since this formicarium has clear sides, the playing card placed on top wasn't doing much. I designed and 3-D printed a lid made to go over the whole nest. 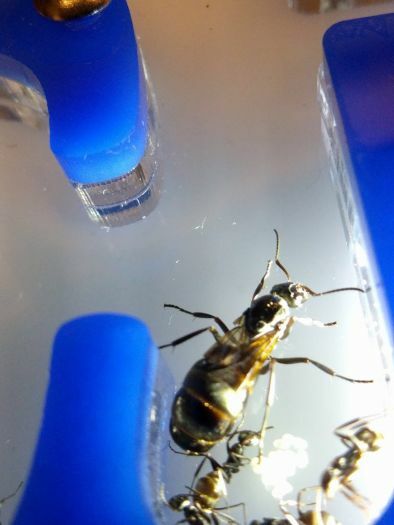 After only 12 hours, I lifted up the lid and found the queen laying an egg. Wasn't able to get a photo, sorry. They still haven't discovered the food in the outworld. I also placed a small bit of sand in the outworld for them to place around the larvae when they are ready to pupate. A few of the eggs have hatched into small larvae. I thought that the colony wasn't eating, but they must be. The eggs have hatched and a few of the larvae are already halfway to the pupal stage, which means they were consuming some protein. A few days ago, I noticed that the queen was having a little trouble walking. Because she's so much heavier than the workers, she can't support herself on the smooth acrylic. I'm designing a 3-D printed nest for them to live in. They now have about 6 larvae of assorted sizes and 2 eggs. The queen has finally dropped one of the four wings. It's sitting in a corner of the nest, near what I assume is their bathroom site. The brood is developing well. They have a decent pile of medium to large larvae, some of which are almost ready to pupate. Edited by Mettcollsuss, January 28 2018 - 7:55 AM. With the length of the antennal scapes, you can be 100% sure these are F. subsericea. Do you mean that these are definitely Formica subsericea, or that I should use the antennal scapes to find out? Oh, I mean that I can see they are F. subsericea. This species has long antennal scapes. Edited by Batspiderfish, January 28 2018 - 3:06 PM. I haven't tried feeding them superworms yet. They do love mealworms, however. 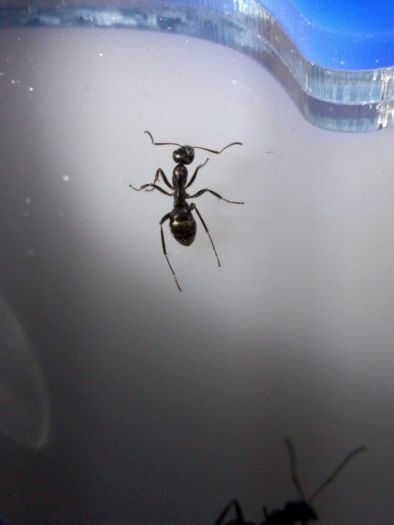 How long did your ants Australia nest take to deliver. I might buy one. I'm not sure; my parents got it for me for Christmas. I now have proof that the colony is foraging. Looking into the nest, I saw that they had dragged in a couple day old mealworm (one that I was about to remove). Since this mealworm was dried up and the ants probably wouldn't be able to get much from it, I placed in a fresh one. I also replaced the sugar-water in the liquid feeder and dyed it red so I could tell if they drink it. A few minutes, one of the workers —the one that I have dubbed the "crazy" worker— found the mealworm. It is now in the nest along with the old one. I call her the "crazy" worker because, well, she is. 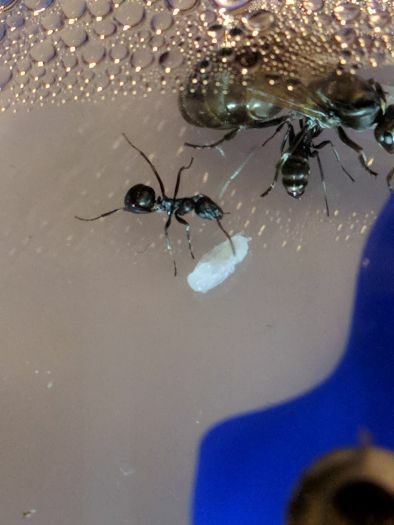 Whenever I take the cover off the nest, while the others protect brood and the queen, she always runs toward the threat. She starts smelling the plexiglass top and gets in attack/defense position. When I gave them the mealworm earlier today, she started wrestling and spraying the lifeless body. No larvae have pupated yet. I expect they will soon though, now that they're eating well. EDIT: This isn't the only F. subsericea to seem to have a "crazy" worker. I had a second colony of the same size that I sold, and they had one too. Has anyone else who keeps this species noticed this? Edited by Mettcollsuss, January 31 2018 - 6:02 PM. Okay I know I just updated this journal like an hour ago, but, PUPAE! Well, one anyways. And I have photos now. 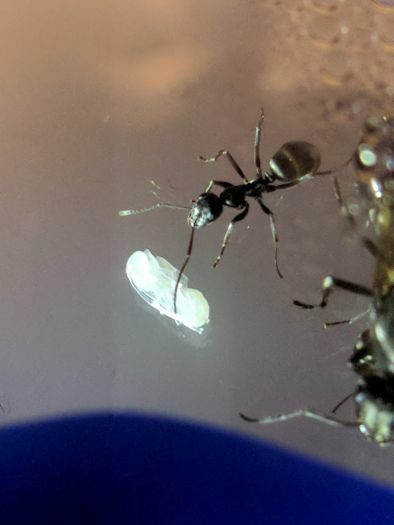 This colony had cocoons in the past, but this time it's an exarate pupae. I actually like it better that way, because I can track the development.